Nokia has filed an application with the U.S. Patent and Trademark Office for a magnetic vibrating tattoo that would alert the bearer of various activity that needs attention on their wireless handset. The idea is that the inked person wouldn’t have to interrupt others with a buzzing cell phone in a quiet environment or alternatively, wouldn’t miss an important call in a very loud setting. The process would involve an individual being tattooed with ferromagnetic inks that react to magnetic fields. The inks would first have to be demagnetized, then the user would have a tattoo applied with said ink (just like any other tattoo) and finally, the ink would have to be remagnetized afterwards by bringing it in close contact with an external alternating magnetic field multiple times. Once in place and paired with a phone, the tattoo would vibrate in accordance with signals sent from the handset. For example, a different pattern could be applied for different callers, incoming text messages or emails or even as a low battery indicator. 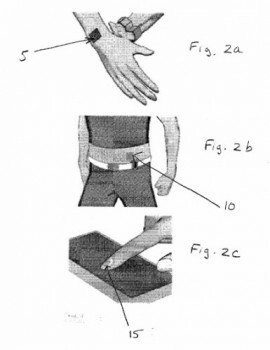 If a permanent option isn’t for you, Nokia also filed patents for alternative methods including a temporary magnetic spray, a sticky decal or stamp or even a wrist band. If you think going through airport security is a pain now, just try explaining to the TSA that your magnetic tattoo is setting off their metal detectors. The patent was filed on March 15 and lists Zoran Radivojevic as the lead inventor ahead of three others.